Innovative design for maximum horse comfort. Anatomically correct, curved, padded headpiece for maximum ear pressure relief, particularly important for wide ear-base ponies and cobs, who often have problems with other bridles. 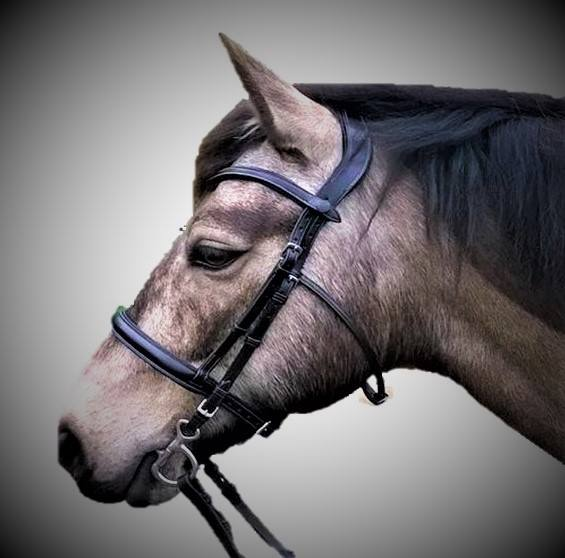 Soft, padded, simple Cavesson noseband which hangs from the headpiece itself. This eliminates the 'Ridge' pressure and 'Base of Ear' pressure caused by noseband headpieces which run either under, or over the bridle headpiece. The Saturn bridle, features a removable throatlash, which simply slides onto the cheekpieces. It also features a softly padded browband which is cleverly shaped so that it lies flat across the forehead, vastly reducing side pressure at the base of the ear. It has press stud fastenings, making it quickly and easily removable, or changed WITHOUT the need to take the bridle off the horse. This fastening also vastly reduces the 'Bulk' of the browband loop at the rear of the headpiece, where a major nerve cluster is situated. The Saturn is Handmade using only the finest, butter-soft Italian Leathers. This bridle is designed with maximum comfort in mind for horse and cobs and for riders who want a flattering design that is a little bit 'Special'. The Scorpio has an anatomically shaped, lightly padded headpiece which gives maximum pressure relief behind and at the base of the ears. The headpiece is wider at the Poll than the Saturn bridle, so it also flatters horses with slightly larger heads. 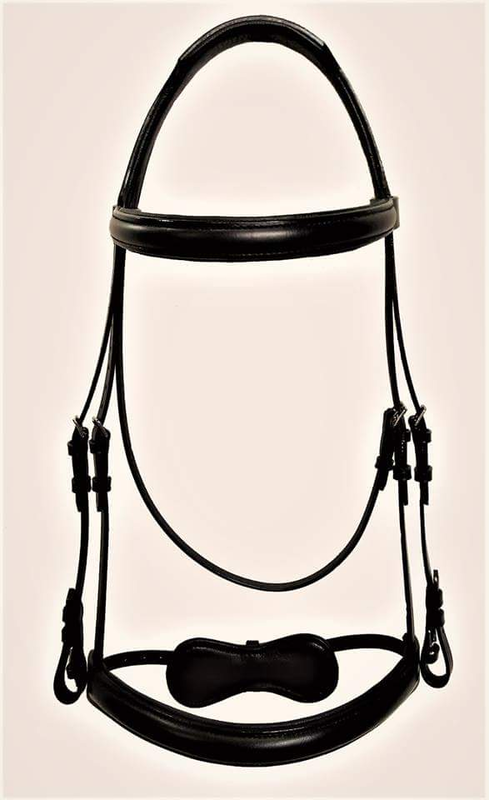 The soft, lightly padded noseband hangs from the headpiece and is anatomically shaped. It is wider at the front and tapers gently down towards the cheekpiece hangers, where the Bulk of the padding stops. This removes the problem that is often found with wider padded nosebands, which create 'Bulk' and, therefore, pressure at this point and this can also interfere with the rings or sides of the bit. This problem is eliminated by the innovative Scorpio noseband. The noseband also features a padded Chin Pad at the rear and has strap fastenings to either side giving maximum adjustment for horse comfort. As with the Saturn range, the browband is our 'Quick-Click' design and is detachable without the need to remove the bridle from the horse - very useful in Dressage when you need to change to your 'Bling' browband. As Saturn removable throatlash. Available in Cob and Full sizes in Black or Brown. 'Quick-Click' Bling browbands are also available for this bridle. The Titan is an anatomically designed bridle for horses who are beyond X-Full or who find X-Full bridles are on the last holes. This bridle is guaranteed to fit the biggest heads, yet still provides the same comfort as our Saturn and Scorpio range. The padded headpiece has 3 straps, enabling a wider headpiece design which suits bigger heads. It features a longer cut-away ear design, giving maximum room for long ear-base horses. The noseband, which hangs from the headpiece, is also long enough for the largest horses and has a padded Chin-Pad at the rear for maximum horse comfort. 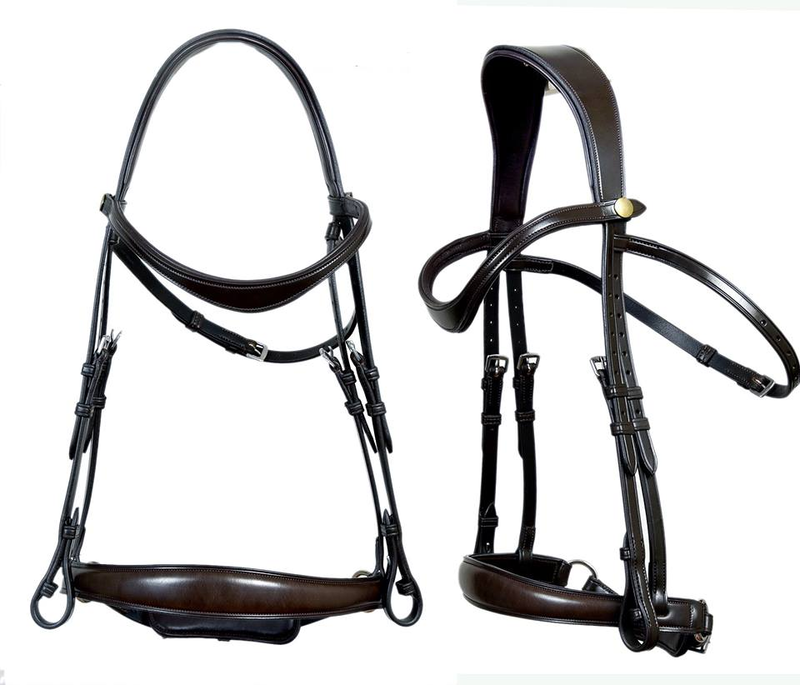 This is fully adjustable for size, by way of noseband straps either side which buckle onto the Chin Pad. The shaped, padded Browband is our Quick-Click design and can be removed or changed without the need for removing it from the horse. Nosebands are available in flat Hunter style if required.